The 508 meets demand for mid-size cars in China. ALICANTE, Spain -- PSA/Peugeot-Citroen expects to sell more units of the new Peugeot 508 car in China than in the company's home market of France. If PSA's forecasts are accurate, it will be the first time Peugeot will sell more units in a single country outside of France for a model that is available in Europe. PSA says China will be the largest market for the 508 as the French carmaker seeks to boost its sales outside of Europe. Of the 200,000 global sales forecast for the 508 in 2012, PSA expects 65,000 to be in China and 38,000 in France, a Peugeot spokesman told Automotive News Europe at the 508's press launch here. The 508 meets demand for mid-sized cars in China, which accounts for roughly 25 percent of all cars sold in the country, the spokesman said. While Europe will get sedan and station wagon variants of the 508, only the sedan version will be sold in China because of weak demand for wagons in China. 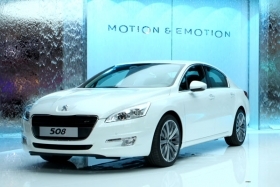 The 508 replaces two slow-selling Peugeot cars -- the 407 mid-sized car and the 607 large sedan. In Europe, the 508 will compete against cars such as the Renault Laguna, VW Passat, Opel/Vauxhall Insignia and Ford Mondeo. PSA plans to sell 115,000 units of the 508 in Europe, includig France. The remaining 20,000 sales will come from markets outside of Europe and China. The 508 will launch in various markets in the coming months through to July. Two-thirds of 508 production will be done in Rennes, France, while the rest will be in in Wuhan, China. China is rapidly emerging as a key market for PSA. The French carmaker expects to see double-digit sales growth in the country this year. PSA's sales in China increased 38 percent to 375,600 units last year. In Europe, PSA's 2010 sales fell 2.3 percent to 1.84 million, according to industry association ACEA. Boosting sales in China is also part of PSA's plans to reduce its dependence on the European market. PSA hopes to sell half of its cars outside of Europe by 2015. Last year, 40 percent of PSA's car sales were outside of Europe.